It is okay deal but the best way to get a more reliable machine is go for one with a bigger wash load, they have stronger bearings, belt and motor. The main reason people complain cheap washing machines break easy is because they purchased a small capacity machine such as 5 to 6kg but are filling them with more like 9kg family loads putting them under strain. its not that great a price, paid 142 from currys for the beko 8 kg model on ebay, this should have been more around the 160-170 mark, and while I am an advocate of Beko products, Samsungs with 5 years warranty can be had from as little as 280 to 340 pounds, not that much of a premium to be paid for better quality and longer warranty at least in my opinion. Completely agree.. I wanted to buy a bigger drum but it wasn't available in black I will need to be careful. I was checking lg and Samsung for last 2-3 days but water in London is hard as well so I don't see any machine lasting more than 6 years anyway. Don't these catch fire and burn your house down? its not that great a price, paid 142 from currys for the beko 8 kg model …its not that great a price, paid 142 from currys for the beko 8 kg model on ebay, this should have been more around the 160-170 mark, and while I am an advocate of Beko products, Samsungs with 5 years warranty can be had from as little as 280 to 340 pounds, not that much of a premium to be paid for better quality and longer warranty at least in my opinion. Check reviews on HUKD Samsung washing machine they break after 5-6 years due to main part getting rusty and too expensive too fix. It is okay deal but the best way to get a more reliable machine is go for …It is okay deal but the best way to get a more reliable machine is go for one with a bigger wash load, they have stronger bearings, belt and motor. 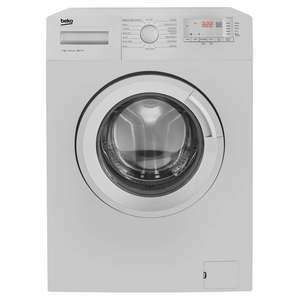 The main reason people complain cheap washing machines break easy is because they purchased a small capacity machine such as 5 to 6kg but are filling them with more like 9kg family loads putting them under strain. Had numerous brands over the years.and my 9kg Beko lasted fewest years before motor packed up. All the smaller load machines died from bearing failures after about 10 years. Bearing replacements have only delayed death due to other component damage. Inclined to agree with your comment, we now have a 10kg machine and easily get 15kg in it! I think you will find that's Hotpoint/Whirlpool/Ariston/Indesit. Remember, the direct cause of fire which resulted in the catastrophic Grenfell Tower disaster was a Hotpoint fridge freezer. Whirlpool (owners of Hotpoint) have blood on their hands. The deal has come at right time. My candy washing machine broke down lately. Beko fridges have excellent reputation of long-lasting. Can’t say the same about washing machines. Agree with Harwinder that most washing machines last 5 years. Beko is cheap but does the job. Every Beko fridge or washer has broken down on me. I had a hotpoint fridge for 15 years without a problem. Bosch washing machines and dishwashers have lasted the longest for me but I still claimed for for faulty parts/floats/door sensors etc with the 5 year warranty. My Bosch washing machine bought in 2003 is still going strong!! The deal has come at right time. My candy washing machine broke down …The deal has come at right time. My candy washing machine broke down lately. Beko fridges have excellent reputation of long-lasting. Can’t say the same about washing machines. Agree with Harwinder that most washing machines last 5 years. Do yourself a favour get a Bosch for say £400 and it'll last 10 to 15 years! I ordered this one from their eBay store using a 10% discount code that was available at the time. Expected delivery Tuesday. This will be replacing a white knight 5kg machine that has served us well. Only changing it due to getting all black appliances. I hope I've made the right choice. Mine from 2001 is as well - never needed repair. Not over used as a single person + dog household but still not bad! Mind you, it cost £250 - I'm sure you could buy a new car for that way back then! I think you will find that's Hotpoint/Whirlpool/Ariston/Indesit. Remember, …I think you will find that's Hotpoint/Whirlpool/Ariston/Indesit. Remember, the direct cause of fire which resulted in the catastrophic Grenfell Tower disaster was a Hotpoint fridge freezer. Whirlpool (owners of Hotpoint) have blood on their hands. Do some research before making offensive and libellous comments. Loads of comments on larger capacity washing machines being the way to go .. rubbish as I bought a candy last year with a 10 kg was king capacity and it lasted 14 months ! When complained to candy/hoover they pointed out that I had 5 years parts warranty but the labour was going to cost at the minimum 129 pounds to do ?? What a load of rubbish !! Needless to say I won’t be purchasing another hoover/candy appliance ever !! And I feel it doesn’t matter how much you spend it really is a matter of luck sometimes ! Don’t think spending 6 or 7 hundred pounds plus negates the fact is it’s just a lottery as I know people who have had Beko or other so called cheaper machines that have lasted 10 year plus ! Pay all you want but you’re as well taking your chance with a cheaper one that’s easily and cheaply replaced unless you want to pay 100s on a extended warranty ! Don’t see the point though ! The model found to be the source of of the fire after investigations cleared safety checks and was not subject to a subsequent recall. The building did not have a sprinkler or fire alarm system and was wrapped in flammable cladding. The blame lies firmly with the council who own and maintained the building. Thoughts go out to all who lost loved ones and friends in that terrible disaster. Loads of comments on larger capacity washing machines being the way to go …Loads of comments on larger capacity washing machines being the way to go .. rubbish as I bought a candy last year with a 10 kg was king capacity and it lasted 14 months ! When complained to candy/hoover they pointed out that I had 5 years parts warranty but the labour was going to cost at the minimum 129 pounds to do ?? What a load of rubbish !! Needless to say I won’t be purchasing another hoover/candy appliance ever !! And I feel it doesn’t matter how much you spend it really is a matter of luck sometimes ! Don’t think spending 6 or 7 hundred pounds plus negates the fact is it’s just a lottery as I know people who have had Beko or other so called cheaper machines that have lasted 10 year plus ! Pay all you want but you’re as well taking your chance with a cheaper one that’s easily and cheaply replaced unless you want to pay 100s on a extended warranty ! Don’t see the point though ! Hoover/Candy are dreadful, So are Hotpoint/Indeshite/Ariston etc..
Beko are great for the price and will usually outlive all the above brands. They're also cheap enough to replace. You can buy a Beko for £200 that'll last 5 years or a LG for £400 that'll last 10 years. In 5 years technology changes and you might want to change washing machine anyway. Very true plus you can wash a king size duvet and other large items rather than take em to a dry cleaner which saves more cash in the long run - bigger 9-10kg load saves more cash in the long run i wouldnt go for anything less now! Beko are actually not bad and made in the UK! Then there are the dimwits who dont empty the pockets of their garments and end up with kirby grips, those stupid colour catcher cloths and other small items getting caught in the impeller of the water pump causing it to jam, overheat and burn out causing a fire. How many of you actually know what that hole in the bottom of the front of the machine does and how many of you have opened it to see what is lost in there? Or perhaps the ones who overload the amount of powder in the machine causing the water pump exit pipe to fur up with powder and end up blocked like a water pipe filled with calcium - the main reasons the machines breakdown I have seen em all and 70% of the time its just like computers - USER ERROR! How many of you have actually RTFM of the product you bought - I bet the % answer is in single figures!!! You are referring to tumble dryers which have the fault not washing machines which rarely go on fire unless you have burned out the bearing by overloading and not using the machine as was intended - duh no wonder there is so much misinformation when people are so misinformed lol but hey thats your average pea brained diabetes type II obese football, fags and beer Brit these days! Will ask John Lewis to price match tomorrow. Advantage of buying from them is that they give 2 yrs guarantee on all electrical items they sell. Beko washing machine is still going strong after 3 years. Also need a new washing machine. It seems everywhere want around £40 to collect your old one and install the new one. Bought my Hotpoint around 10 years ago from Currys and did not have to pay any extra to fit or collect the old one. Mine lasted 5 and has just given up the ghost. Hence I'm here now!